Waiting on line at the Berkeley Post Office watching hundreds of the same size box being stamped and processed, I couldn’t resist asking the two young guys racing between their truck and the postal window carrying a load each trip, “What’s in the boxes – you’ve got lots of customers!” That’s how I was introduced to the virtues of Turmeric, and Synchro Gold. There have been thousands of studies conducted on turmeric and researchers are still discovering vast benefits. Recent studies show turmeric to be just as effective as the leading pharmaceuticals used to treat high cholesterol, eye diseases, depression, stroke and heart attack prevention, pain and other inflammatory afflictions, diabetes, and cancer (1). To name the most well-known, but the list of benefits continues to grow. There is now evidence demonstrating that a newly discovered turmeric component called ar-turmerone can increase the production of brain stem cells by 50-80%. Researchers believe that it bestows profound neuro-protection against oxidative stress, and that it could therefore be effectively used in the treatment of Alzheimer’s, dementia, depression, and other neurological diseases (2). Most researchers agree that the turmeric’s profound healing abilities can be traced to its powerful anti-inflammatory action. For a long time, the component curcumin was given all the credit for this activity, but it seems like turmeric has a lot of other tricks up its sleeve (like ar-turermone, the compound mentioned above). 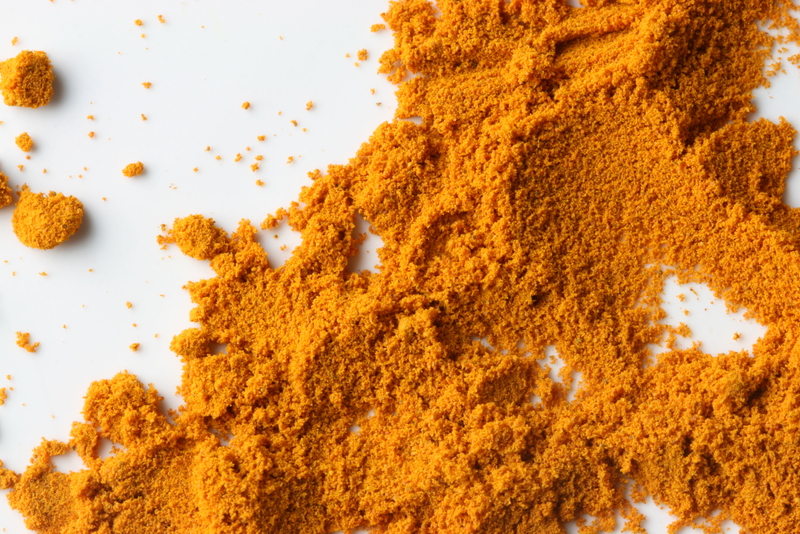 Full-spectrum turmeric (as opposed to a curcumin extract) is especially effective because it operates by both mechanisms of anti-inflammatory action. Most anti-inflammatory foods and substances operate in one of the following ways: they neutralize inflammation-causing free radicals in the body with a flood of antioxidants, or they stop the body from producing the chemicals that initiate inflammation in the first place (this is how aspirin and most over-the-counter pain medications works). But turmeric combats inflammation through both of these mechanisms simultaneously. Its multi-pronged approach allows it to work wonders for aches, pains, and arthritis (by stopping inflammation at the source), while also strongly supporting the immune system with antioxidants. In fact, turmeric isn’t just packed with antioxidants—it also stimulates the body’s production of its own four most powerful antioxidant enzymes, namely superoxide dismutase, glutathione, glutathione reductase, and glutathione-S-transferase (3). You may have noticed that health food stores have picked up on turmeric’s rising stardom—their shelves are well-stocked with turmeric supplements of all types, usually in “pain relief” section of the supplement aisle. Most of these supplements come in the form of encapsulated powders. While they sometimes do the trick, the truth is that there’s far better ways to get your turmeric. Raw turmeric root is a better bet: it’s obviously as fresh as can be, and there’s no strange processes standing in between you and all the turmeric’s goodness. The raw root is often difficult to find at grocery stores, though, and bioavailability can still be an issue. Make no mistake—if you can manage to get raw root, you’ll still derive plenty of benefit from it; there’s just an even better way to integrate turmeric into your life. Drinking CO2-extracted turmeric liquid is by far the best way to get the most out of turmeric. Synchro Gold is an outstanding full-spectrum extract that’s “liposomalized”—meaning it’s specifically blended to make the turmeric bind to phosphlipids (fats) that increase its bioavailability sixfold. The formulator also blends it with black pepper fruit extract, which further activates the turmeric alkaloids and increases absorption by up to 2000%.